I contact the wonderful folks over at Booty Parlor about trying out a few of their products and they were happy to send a few things out. The items I requested were: Booty Parlor Flirty Little Secret Luminizing Body Butter With Pheromones and Kissaholic Lip Stain (will be reviewed separately). The purpose behind the body butter is just like most body butters to help hydrate your skin. Booty Parlor's Lumininzing Body Butter though has pheromones as well as a pearly pigment that delivers a wonderful glow. The body butter comes in one scent only which kinda stinks for some but, I love the smell of the Blackberry Honey scent!! The smell of the Luminizing Body Butter smells good enough to eat but please DO NOT eat it or lick it off your partner as it isn't edible. Good uses for the body butter would be if you are going out with your partner or to the club the sparkle is awesome!!!! Add in the pheromones your will have your man all over you more than usual. You will get 5 ounces of lush smelling body butter!! I got the chance to review some items on my blog as a part of the Eden Love's Bloggers Program I had been lusting after the Shunga Oriental Bath Crystals for awhile now. I had heard so much great stuff about them and even smelt them at home parties before so I was glad to see that Eden carried them as well. At one point Eden offered these in three scents:Ocean,Aphrodisia and Lotus Flower, I am reviewing the Ocean. Shunga is known for their aromatherapy products from oils to bath soaks. The Shunga Oriental Bath Crystals are designed to help relax sore muscles as well as help you relax with the aphrodisiac. They are made of salt crystals from the Dead Sea, the ocean sent was calming and very relaxing. Remember the cool bath tablets we had as kids that turned the water colors? This is a grownup version, I used very little of the Shunga Oriental Bath Crystals an it automatically turned my bath water a light blue and bubbles started to form. What's Included in the Set & Packaging? The reason I called this a "set" is because you get the canister that holds, 20oz of theShunga Oriental Bath Crystals, a floating candle and a perfect seashell for scooping out the bath salts. When you get the bath crystals they come in a black and gold tin, there is a red ribbon with a charm like oriental design hanging from it. Upon opening the canister you don't have to worry about the crystals leaking everywhere or anything like that from shipping. The Shunga Oriental Bath Crystals can be found inside a plastic bag that you can you open and dump it into the canister or leave it in the bag. On top of the bag you will find the seashell for scooping out your bath crystals and the candle. Nothing about the packaging screams "sexual item" you'll find a picture of an oriental man and woman, the label is black with white writing. 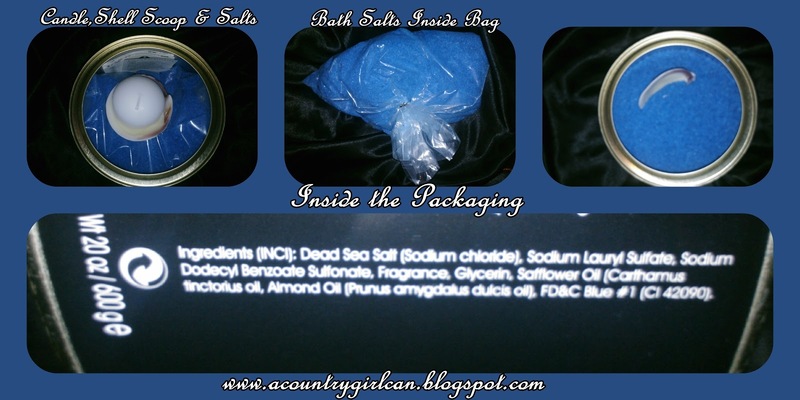 Ingredients:(INIC)Dead Sea Salt (Sodium Chloride), Sodium Lauryl Sulfate, Sodium Dodecylbenzene Sulfonate, Fragrance, Glycerin, Carthamus Tinctorius, Prunus Dulcis. I loved the way this smelt and the scent stuck to me which is one thing I like when using bath soaks. Sadly this has been discontinued from Eden which I was worried would happen :( Glad I was able to snag these for review when I did. I absolutely love them even though I don't bathe that often I prefer showers over sitting in a bath. I would recommend this pretty much anyone who loves sweet vanilla scents, I love my Cake Beauty Products and wouldn't trade them for the world. For this small amount it is a little pricey but that is to be expected with the quality of the Cake Beauty Products. What do I think Cake Beauty Indulge Perfume is best used for?! I personally use this AMAZINGperfume to spray on my lingerie before putting it on. This product would work for anyone woman who likes sweet vanilla smells. I personally am bothered by several different perfumes and other fragrances so I was iffy on trying out the Indulge Perfume but since I won this in a giveaway. I figured why not give it a try, if I don't like it or I am allergic to the perfume I could simply pass it on. The texture and consistency is that of most other perfumes you may already own. Indulge doesn't leave you sticky or oil marks on your clothing that I have experienced with other perfumes. I have not been left greasy or any of that from this amazing perfume. I would assume this tasted like any other perfume that is NOT edible, I personally haven't licked myself or tasted this. My ex on the other hand, tasted it by accident I forgot I sprayed my chest area with it while getting dressed in lingerie he said it didn't taste so good. If you don't like sweet smells I would steer clear of this. I personally love the warm sweet scent of vanilla that is in the Indulge, I also can smell a light powdery scent in the undertones of this perfume. I use this often when I put on my lingerie with the bottle being 1.7oz I still have a great deal left in my bottle. I usually go "overboard" according to some with body sprays and perfumes cause I spray from head to toe, with that being said not much is missing out of my bottle of Indulge. The scent itself last for a few days on lingerie an lasts for me about 24 hours on my skin. What do I like best about Cake's Indulge Perfume?! I LOVE the fact that I can have my "cake" without the fat and calories, well that but my main love for this is the light scent that adds to the mood with my lingerie. The packaging for Indulge is pretty simple and really cute!! I love the pink box with the silver writing on it. The bottle itself is GLASS so it is breakable, so handle with care. The lid is metal as well as the sprayer on the bottle used for application. You could very easily travel with this amazing perfume whether you are traveling air or ground. Cake's Indulge falls in the 3oz class for flying for carry-on items, if you wanted you could put the in your checked luggage just make sure that it's protected so it doesn't get broken. Are you having a night out with your partner and you want to be able to freshen up easily?! YES, just toss Indulge into your purse that is how small the bottle is. I am really glad I took the plunge on this wonderful perfume when I won the Cake Beauty Giveaway! I regret nothing about this product that I have about many other perfumes I have bought in the past. My overall experience with Indulge has been wonderful, so far no triggered allergies and wonderful reactions from my ex. I can't wait to spray down my lingerie and toss it on to see what reaction I get from my new partner.